As a China-based professional hopper concrete mixer manufacturer and supplier, Zhengzhou CamelWay Machinery manufacture will introduce the features of double spiral belt concrete mixer to you. High Mixing Efficiency, well mixing evenness. Double-spiral-belt continuous mixing blades, instead of traditional shovel mixing blades. Then can be shorten the mixing time at least 50% and the mixing evenness can improve 15%. Reasonable structure design, easy maintenance. Adopting new multiple sealing patent, and imported sealing elements, the sealing performance of the mixer is nice and machinery working life is longer. Equipped with beltreducer or high reliable reducer. Well mixing evenness, low noise. Customers can choose depending on own requirement. Top-level automatic lubricating pump. Centralized lubrication supplying ensures the shaft end sealing more durable. Less power consumption. Power safety locks design, so as to assure life safety. Exquisite processing is the reliable guarantee of the product quality.Has long working service. 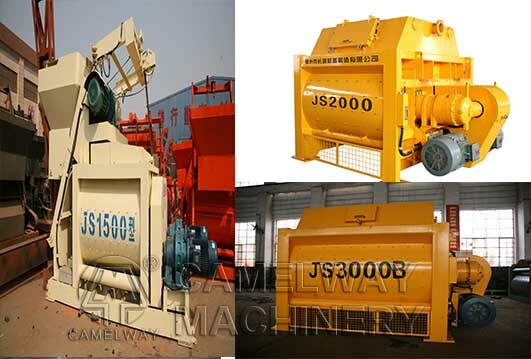 If you are interested in the concrete mixer or buy it, you can contact us. We will give you a reply in 24 hours.